It’s also important to be aware when fitting new shoes is their ability to stretch over time. Different shoes will have a different range of stretch that is governed by the shoe’s design and core components. Leather is used around the big toe where we want the shoe to match the shape of the toe over time. In general, it is more durable, molds to the shape of the foot and retains friction whilst sweaty. Microfibre is used on the upper piece above the toes where we want the shoe to retain its elasticity for a better more supportive fit. In general it is softer on the skin and has an elasticated memory. I have found that SCARPA climbing shoes stretch only marginally to a point where they slip on my feet without too much effort, yet still provide exceptional fit and performance throughout their lifetime. This is because even the stretch of a climbing shoe is considered during the design process, so if you have the right fit then the stretch shouldn’t matter. Tips: Despite the design, a climbing shoe has unlimited stretch potential and to avoid this you should take them off when you’re not climbing. It’s worth noting that some shoes will stretch more, whilst others will stretch barely anything at all. This has to do with how structured a shoe is. For example, a more structured shoe like a Boostic will require the user’s foot to fit more precisely from the beginning as they will take a long time and be very slow to change shape. A model like a Drago or Furia however will quickly change shape to the user’s foot as it has very little structure. 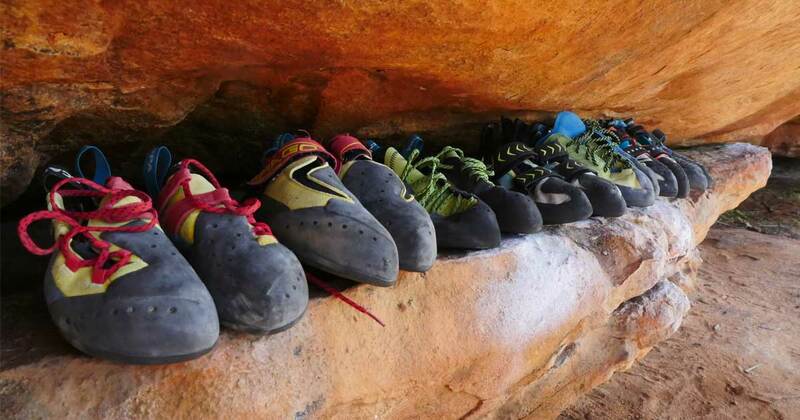 Another myth in the climbing world is that “Down Turned” shoes are better or “more technical” than “Flatter” shoes. 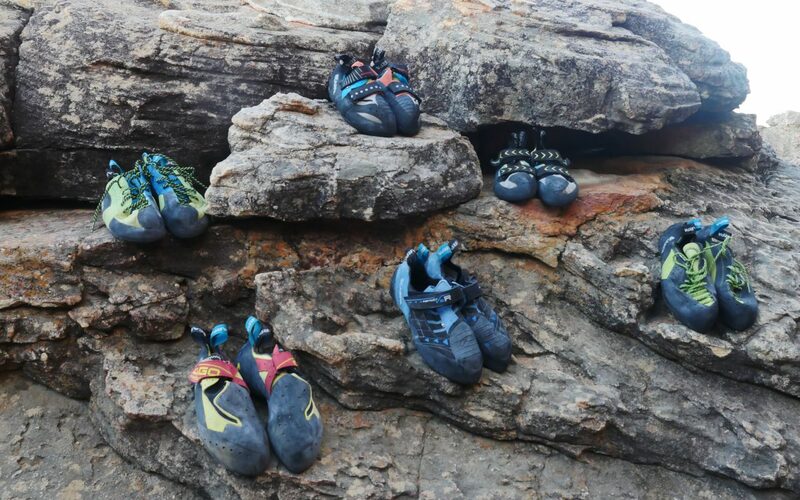 Climbing shoes in reality are built for purpose, and different shoes will be more effective on different terrains. 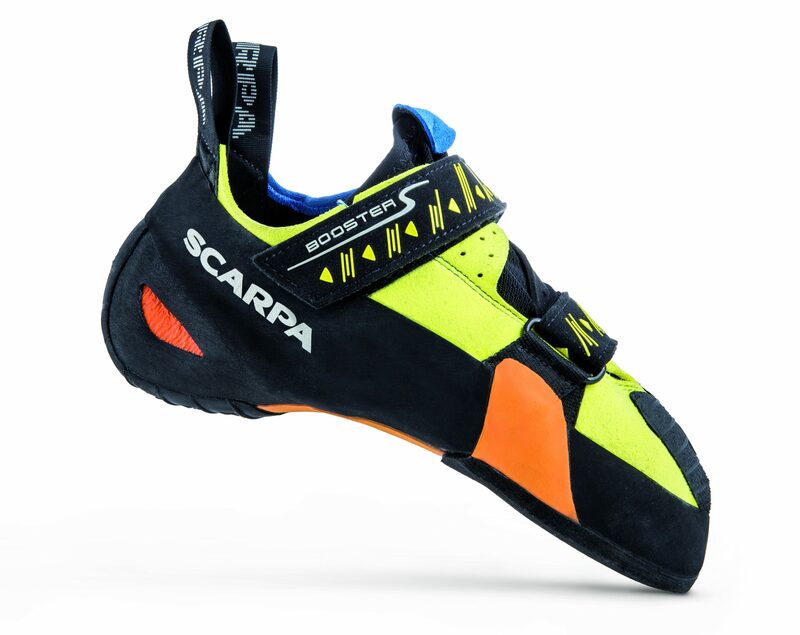 An interesting fact for you is that despite common assumptions that climbing shoes are designed for different angles of climbing (vertical/overhang/slab), it is actually the focus of SCARPA to design climbing shoes specific to the type of foothold they are standing on. When angle comes into effect more, the more vertical or slabby terrain generally requires a more supportive shoe that won’t flex under your whole-body weight whilst standing on small edges. Maestro: Very good at standing on small precise footholds on slab and vertical terrain whilst retaining the support for longer, more enduring pitches and wall climbs. This means that both down-turned and flat shoes should be considered “Performance Orientated Shoes”, it just depends on what you’re doing. Does rubber make a difference? The rubber on climbing shoes is massively variable, from the Rubber compound to the thickness across the edge of the shoe and even how soft/stiff the rubber is. A stiff uncompromising compound that allows you to stand on even the smallest crystal and gain maximum support through your toes. A soft malleable compound that molds to the shape of the hold your standing on for maximum grip and stickiness. Stiff Rubber: is far more effective on terrain where I’m standing on small edges and need to put a lot of power through my feet, or where support through the edges of your shoes are vital e.g. standing on small edges and crystals. 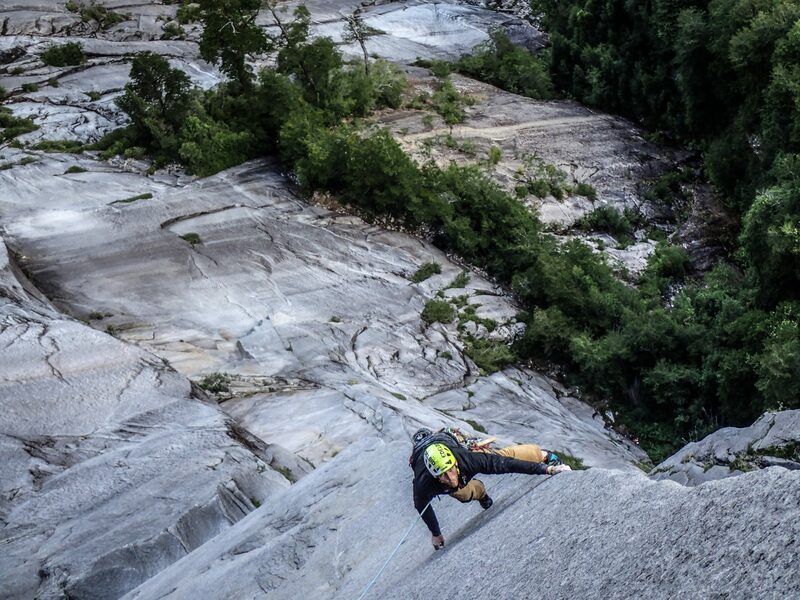 Soft Rubber: is far better at smearing your feet where there is no distinct edge to stand on, or getting friction on large slopey holds where the rubber has to mold over a greater surface area to gain friction. Rubber Thickness: The thickness of the rubber is also important and will influence the support you get as well. For example, Instinct Laces are 3.5mm XS Edge, whereas Boostic are 4mm XS Edge. The Boostic has a tiny bit more support through that extra 0.5mm which is very noticeable when standing on micro edges! 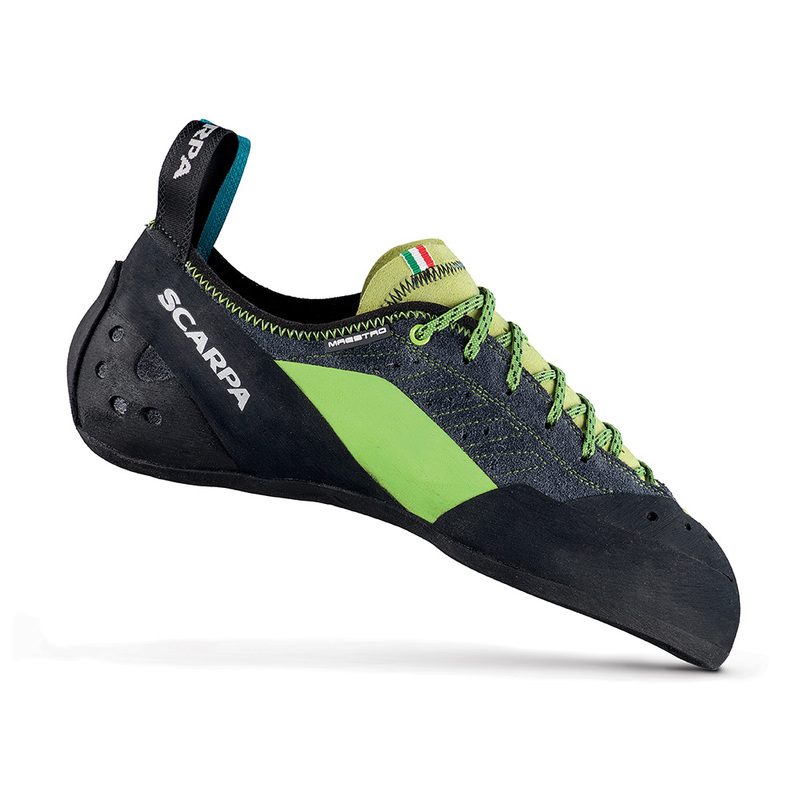 M50 Rubber: SCARPA also uses a different type of super sticky rubber called M50 in the “SOFT LINE” that they wrap around the toe to provide unparalleled connection between rock and foot making these shoes the best in steep climbing techniques such as toe hooking! Doubling Up: You will also find that SCARPA use both the XS Edge and Grip2 rubber compounds in models such as Maestro and Instinct. The reason for this is that these models are designed to produce exceptional edging capabilities, but being an extremely technical shoe still require a softer rubber on the heel to provide better grip when smearing the heel over flat/rugged surfaces. A 2mm Grip2 rubber heel is the best option for this, that is why for all-round technical climbing, these shoes have no equal! Rubber and Your Weight: I have found that climbers over 70kg tend to prefer XS Edge whereas climbers at or below 55kg tend to prefer Grip2. It’s quite simple really; stiffer rubbers provide more support, which means when more weight goes through them they flex on edges far less. For a lighter climber, a stiffer rubber can feel like far too much support, even to the point that they feel as though their shoes knock around like un-sensitive wooden clogs. Children should definitely be wearing softer boots using Grip2 because there is just no way they will be able to have the sensitivity through their shoes with anything more rigid. I am 78kg and I have found that XS Edge rubber has the support for standing on the tiniest edges of El Cap granite whilst still being flexible enough to smear my way up a technical granite stem corner. My 50kg climbing partner couldn’t climb anything on El Cap in XS Edge because they couldn’t feel their feet, they were just too light for the rubber! I do however use Grip2 rubber in loads of situations, especially Lead and Boulder competitions, indoor training, Sandstone, Gritstone and smeary Granite; it just depends on the style. Which is a completely legitimate reason to choose Velcro, but I’d like to take a moment of your time to indulge you in the subtleties and indeed science of climbing shoe closure systems. 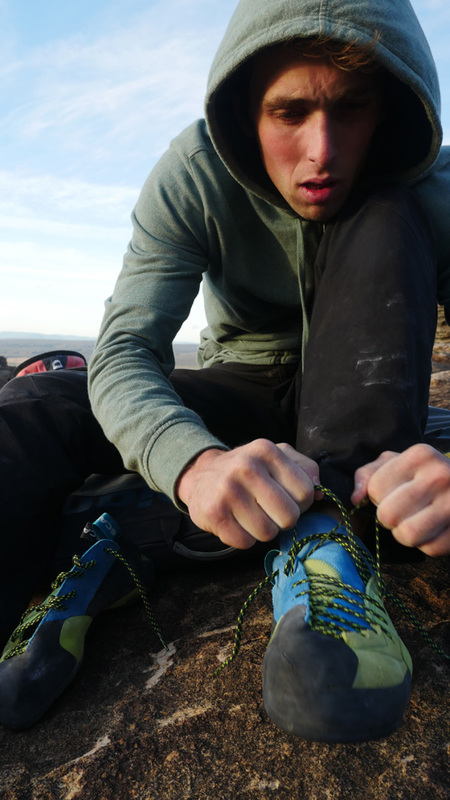 Laces are the preferred for those who want the most versatility and range of tightness from a pair of climbing shoes. I would tend to go for laces for when I was really focused on the subtleties that a shoe can provide in your performance. The obvious advantage to Velcro is the ease of taking the shoe on and off, but what climbers are probably less aware of are the incredible advancements in Velcro fastening systems that have allowed for unparalleled fits across the SCARPA range. Single Velcro with Y-shaped Panelling (SVP): The Drago and Instinct (VS + VSR) has a specially designed Y-shaped panel system where the single Velcro strap pulls across a larger area thereby providing a tighter snugger fit. Wave Strap System (WSS): The Furia S has the WSS, which draws from a series of buckles that spread the pressure across the upper allowing for greater volume adjustment. These shoes retain the full flexibility of a slipper despite having a larger volume adjustment and firmer support for heel hooking. Twin Velcro Straps (TVS): The Boostic, Booster S and Vapour V has twin Velcro straps that are used to provide more structure and less flexibility. This system includes not only two straps, but a second upper layer around the foot that gives extra support for more power through the toe. Finally, the slipper is arguably not a closure system, but that’s why it’s even more important to recognise the technology in how slippers can maintain a secure fit without any obvious way to tighten them. 1) Reinforced Elastic Bands (REB) are bonded to the elastic closure system in the upper, which ensures the elasticity has a much longer lifespan. 2) A complex stitch pattern (remember that stitches don’t stretch) and panel system ensures the slipper upper stretch is minimised over time, but the shoe still moulds perfectly to the feet. 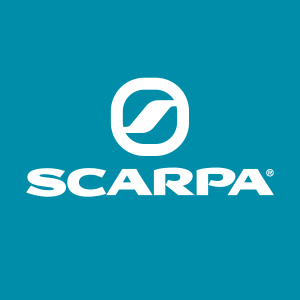 3) The highest quality construction and material ensures that SCARPA slippers last and hold shape longer than any other slipper on the market. A-Grade leather and attention to detail from the best shoemakers in the world are the answer! What the “Heel” is up at SCARPA? 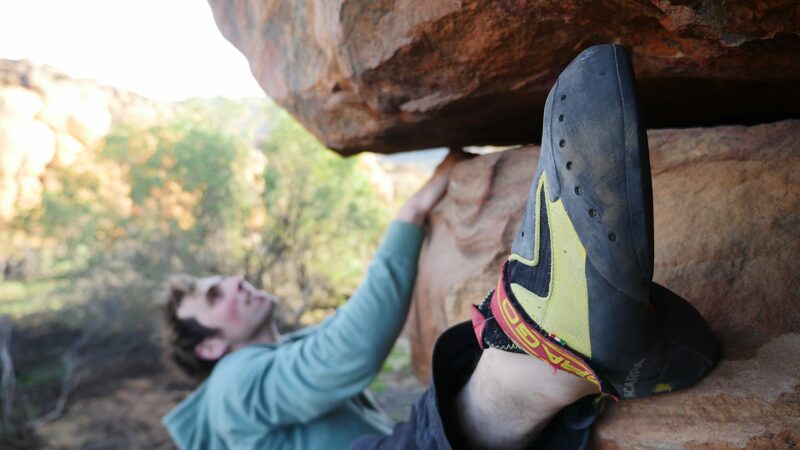 We’ve all heard the endless chat between climbers of which heel is better for hooking in. Technology is always moving forward and what SCARPA pride themselves in is being miles ahead of the bell curve here. Heel design in climbing shoes is a subtle art and these days we’re miles away from just plastering some etched rubber onto the back of your shoe, it is indeed a much more expert process. Relion Heel: The SOFT LINE makes use of Twin Stitching, a Relion Plastic Insert and Grip2 rubber compound combination to bring you one of the most advanced heels in the climbing shoe market. Where the Relion Plastic Insert provides a form of support to the heel, the Grip2 rubber provides uncompromising grip for when you just need to slap that heel on something! The Relion Plastic Insert is only in the Chimera and Furia S. The Drago has the rubber directly on the microfibre of the upper with no plastic insert. Mago/Stix Heel: The Mago and Stix have their own heel specially designed for it’s function. A Flexan Plastic Insert helps maintain the shape and tension of the shoe whilst 0.5mm of Grip2 rubber gives maximum friction for heel hooking. Bonded Heel: In all other models, the rubber of the shoe is bonded directly to the upper, sometimes in 2 layers of XS Edge or XS Grip2 Rubber. Heel Stitching: In the VAPOR and INSTINCT LINE we use a stitch pattern in the heel upper called J-stitching that is much more effective in relieving pressure on the Achilles tendon on less asymmetric shapes. In the Mago’s however, they use a Parallel Stitching which is better for highly asymmetrical shoes. Mystery of the Toe Box? For a long time, I had heard people discussing the toe-box but didn’t quite understand what this was for? Was it comfort or performance? In truth, it’s a bit of both. The toe box is what provides a lot of the foots ability to deal with changing angles and thus the toe box will be defined by the type of holds your expecting to be standing on. High Angle: This is generally best for small footholds and least for smearing because there is not much contact area to work with. But it also depends on other aspects of the shoe combined with the Toe Box that will ultimately decide how a shoe functions e.g. The Drago has a High Angle toe box which means it’s great for standing on small feet, however it also has a very soft midsole with little support which also makes it a great shoe for smearing – Best of both worlds! If you look at the Stix though, it also has a high angled toe box with a soft midsole and unlike the Drago struggles with smearing capabilities. The Stix has the same insert as the Drago, but the X Tension Active Randing System runs underneath the toes giving it an extra layer. The Drago has a PCB Tension Active Randing System that does not run underneath the toes, so the Drago lacks the extra layer of support that the Stix has. Stix has an extremely high toe angle like a Mago. The Drago has less toe angle than both Stix and Mago, less rubber under the toes and thus is better at smearing but suffers on small holds and therefore really depends on the strength of the foot muscles for small foothold use. Low Angle: Low angled toe boxes are generally better for smearing and comfort but without a stiff midsole to support them they will struggle on smaller feet. And so low angled toe boxes are always fitted with stiffer midsoles which then in turn leads them to be less sensitive in general. The Maestro has a Low Angled Toe Box with a super stiff midsole to support the toes on small feet – it lacks the sensitivity but, in the end, still actually smears superbly for a stiff model!